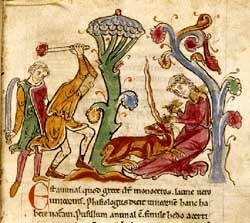 As the ice retreated the vegetation that colonised the land mass of Europe went through a succession of stages from tundra, steppe, scrub through to woodland, although exactly what the nature of that woodland was remains open to question. In his book ‘The British Isles and their Vegetation’ published in 1939, Sir Arthur Tansley [who first used the phrase ‘ecosystem’] proposed that prehistoric ‘wildwood’ formed a continuous canopy of trees dominated by oak. Starting the mid 1950’s pollen analysis of vertical sections through ancient peat deposits showed a more complex picture and that the dominant tree may have been lime rather than oak in many areas of southern Britain and Europe. In 2000 Franz Vera put forward his thesis of a wildwood dominated by large herbivores whose impacts had hitherto been all but ignored by pre-historians. Instead of a climax vegetation of dense woodland, Vera proposed that the competing influences of munching herbivores and growing vegetation produced a cycle of succession from trees to scrub to grassland and back again. This so-called ‘Vera-cycle’ leads to a stable but dynamic equilibrium between open grazed areas and closed canopy woodland areas. Islands of thorny scrub species such as holly, blackthorn and hawthorn develop in the open grassland areas to protect the next generation of trees. When these young trees mature they shade out the protective scrub allowing herbivores to graze or browse their understory preventing regeneration. With no new trees replacing ageing ones, the grove naturally decays or is blown over and so gradually reverts back to a predominantly grazed open ecosystem. As thorny scrub develops, the cycle starts all over again. See the cartoon illustration of this process here. The strong point of the Vera theory is that it explains how species of open and ‘woodland edge’ habitat flourished for thousands of years. It is a fact that mixed aged woodland with glades, rides and a continuous succession of ages classes, felling and regeneration are the most biologically productive and biodiverse woodland ecosystems. 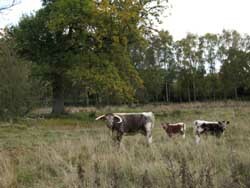 Medieval parks, forests and wood pastures with their complex of customary livestock rights, hunting and wood harvesting are also examples of a dynamic interaction between vegetation and grazing. Rotational coppicing is known to have been practiced since at least 3000 BC in England and can be regarded as a herbivore-free mimic of the Vera cycle. The Vera theory is not without its critics although there is general agreement that the role of herbivores has been under-estimated. Animated Vera cycle. Click foward and backward arrows to step through. Refresh [F5] to revert to animation. The study of plant pollen grains in preserved strata of organic remains is an important science which helps to reconstruct the vegetation history of an area. The technique relies on finding undisturbed areas of peat which have developed over many thousands of years. It also requires the funds to perform the painstaking and skilled work in recovering, processing, identifying and analysing the preserved assemblages of plant and animal remains within the peat layers. Under the microscope pollen grains from different species are readily identified while the presence of certain insect species will give clues as to habitat in which they thrived. It is also important to determine the date of top, bottom and preferably the middle layers by carbon isotope analysis. This allows the depth of individual strata to be dated by extrapolation. The result is a pollen diagram showing plant abundance versus depth of peat and so time before present. Relating pollen abundance to actual plant abundance is a complicated estimate and the whole subject requires experienced practitioners to get good results out. For Herefordshire there is, as far as I know, only one accurately dated and well prepared pollen sequence, namely that from Wellington Quarry [Wellington Quarry, Herefordshire: Investigations of the landscape in the lower Lugg Valley. Jackson, R. and Miller, D. Worcester Historic Environment and Archaeology Service 2004] whose pollen diagram I reproduce in the accompanying diagramme (click to enlarge). Lime and Hazel and colour coded for emphasis. Hazel pollen is an indicator of open, or at least woodland edge, habitat. Lime is an ancient woodland indicator. I also reproduce a pollen sequence from Sidling Coppice, Oxfordshire. Native lime occurs predominantly as Small Leaved-Lime (Tilia cordata) which can occur over wide range soil types and locations. The rarer Large-leaved Lime (Tilia platyphyllos) occurs mainly on limestone, well known populations occurring in Downton Gorge and the lower Wye Valley. Lime was a dominant component of the Neolithic wildwood in Herefordshire and southern Britain but is now confined to a small proportion of ancient woodlands. 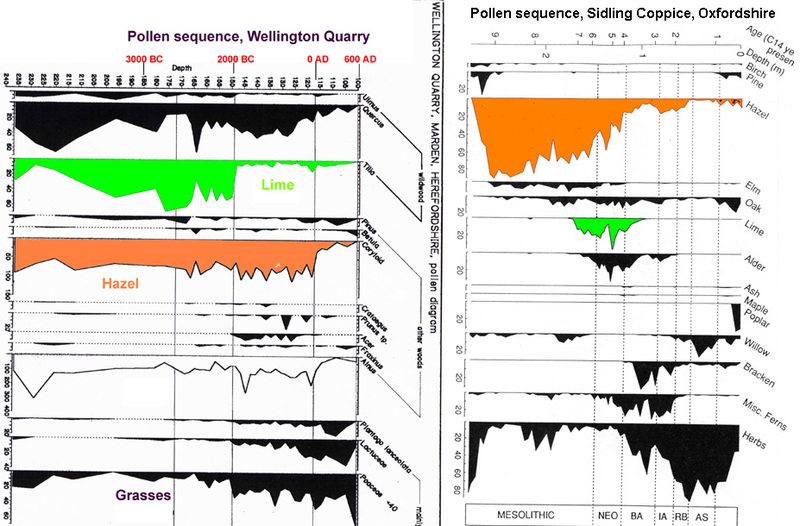 Analysis of pollen sequences by James Grieg show that the once abundant lime had by about 1000 BC declined drastically relative to other tree species. By Roman times Lime would have been a minor component of woodland. The reason is probably that Lime is a ‘continental’ species regenerating happily in a climate of cold winters and warm summers. 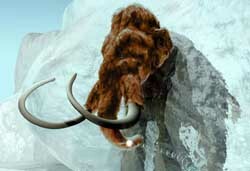 There was a climate optimum (see temperature graph above just below the mammoth) for a long period up to the end of the Neolithic since when mean temperatures declined. By this time Britain had also become separated from mainland Europe greatly reducing ecosystem colonisation. Lime leaves and bark are especially palatable to herbivores and as Lime seedling survival rates reduced so too did Lime as a component of woodland which was by this time being exploited as humans settled the land. Lime trees are extremely long lived species and can persist vegetatively almost indefinitely. They regrow vigorously after felling and will strike roots when branches are in contact with the ground. Limes trees do not re-colonise new ground in Britain if the parent trees are destroyed by agriculture, shading by exotic trees or grazing. There are no known examples in Britain of woodlands with native lime that are not of ancient origin. All this means that today’s native Lime populations are genetic descendants from those of the original wildwood. They are coppice lime stools in Herefordshire woods that maybe older than Stonehenge. As to the extent, character and uses of woodlands in pre-Domesday Herefordshire there is little direct evidence outside the pollen record. Archaeological research in Herefordshire has gathered pace in the last few years. Aerial photography and development-driven archaeological digs have greatly increased the number of known settlement sites from pre-Bronze age to the Romano-Britain period. 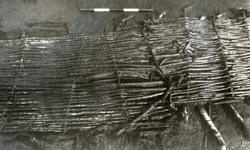 Evidence therefore points to a much greater extent of settlement, farming and stability from pre-Roman to Domesday than had been assumed before. This in turn implies that the proportion of woodland, whatever it character, was also much less than previously thought. Oliver Rackham estimates that Roman Britain had at most 30% woodland cover and by the Saxon period remaining woodland would have been much fragmented. Holocene vegetation and climates of Europe by Huntley and Prentice 1993.